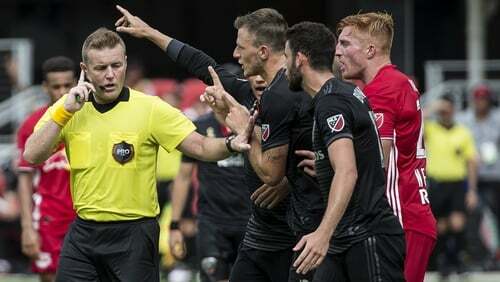 Irishman Alan Kelly has been named the MLS Referee of the Year for the third time in four years. Kelly, 43, moved to the States in 2014 having served as a referee in the League of Ireland for 15 years. He landed the honour in 2015 and 2016. This year, he took 54.49% of the player vote, 43.14% of the media vote and 41.67% of the club vote. That gave Kelly an overall average of 46.43% to make him the clear winner. The Corkman was named the PFAI Referee of the Year five times when officiating in his homeland and his reputation continues to soar. "I never thought my job would ever be refereeing games; it was always a hobby or a pastime or a passion for me, but this is what it is," he told RTÉ Sport's Darren Frehill last January. "It's given me a different perspective on the game itself and the job I do but one I'm really happy to have had the opportunity to do - later in my career yes, but better late than never."